McDonald’s is a world-leading family restaurant brand in the quick service sector. The UK business comprises more than 1,270 restaurants across both our company and Franchise estate. We are at the heart of hundreds of communities across the UK. Not only do we employ over 120,000 people across our restaurants and in head office, but we also work with hundreds of suppliers and over 17,500 British and Irish farmers. People are our greatest asset and fundamental to our successes. Central to our vision is our policy of providing career opportunities for all employees to develop to their full potential; 9 out of 10 restaurant managers and 1 in 5 franchisees started their careers in our restaurants at entry level. Whatever you're looking for from a job, you can find it with us. We offer flexible hours, accredited training, fantastic career prospects and a whole host of other rewards and benefits that fit around you and your lifestyle. Being a McDonald's employee can be the launching pad to a wide variety of opportunities. We have the training and the opportunities to suit your ambitions. I joined the McDonald’s trainee manager programme after reading about the company’s reputation for training and development – I just knew it was something I wanted to be a part of! I was especially excited that I had the option to join the scheme based on my previous experience as a manager. I don’t have a degree so this was a brilliant opportunity for me, McDonald’s allowed me to join at a senior level and really accelerate my career. My favourite thing about working for McDonald’s is the number of people I get to meet and connect with every single day. I’m a real people person, so having the opportunity to spend so much time with customers has been so enjoyable for me. I have also developed many new skills during my time here already. I always thought I was a good multitasker, but now I am so much better! This has had a really positive impact on other aspects of my life, and even day to day tasks I complete much faster! I had management experience before I joined the McDonald’s scheme, however the structured training plan and hands-on approach to learning have really helped to develop my skills, especially when leading big teams - there are days when I am managing a shift of more than 40 people! Getting to this point hasn’t been easy though, and the scheme has been very challenging at times. Taking on an assistant manager’s role is a big responsibility, and something you have to be prepared to work towards. I have big aspirations for my career with McDonald’s, and my mentors are helping me every step of the way. I want to continue to progress through the restaurant hierarchy, and hopefully one day become a business manager running a multi-million pound restaurant. I know that I will have the support to go as far as possible, the rest is up to me! 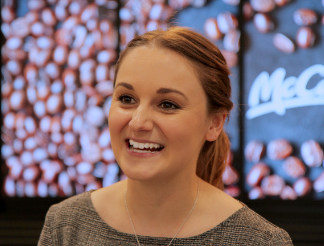 I started my career with McDonald’s five years ago when I joined the trainee manager programme as a recent graduate. Having read about the programme, I was attracted by the structured training plan and the opportunity to gain real management experience in a fast paced and demanding environment. I knew that the training would be intense and that I would be expected to learn fast, but I was ready for the challenge! I didn’t have any management experience before joining the programme, but through a combination of hands-on learning in my restaurant and formal training courses, McDonald’s helped me become a manager capable of running a restaurant with 130 employees! McDonald’s has helped me develop many other skills too, including problem-solving, decision making and leadership skills. As with any job, there are aspects of the trainee manager programme that are challenging. I had a very active social life at university, so one of my biggest challenges was learning to manage my social life around my new flexible shift pattern. McDonald’s is a 24/7 business, which means night shifts are required! While I have always been able to request time off when needed, there have been times when I have missed a party or event. It can be tough, however if you are willing to put in the effort, the opportunities are great. After spending five years working in restaurants, I now work in McDonald’s UK head office as part of the People Team. I’ve loved all of my experiences with McDonald’s and know that the company will continue to support and devleop me as I continue my career. McDonald’s offers great progression to their people…apply today and see what you can achieve!